Indian Railways is a mind-bogglingly intricate network of trains sending out ripples to the remotest nooks and corners of the country. The approximately 8,500 stations across the 115,000 k.m. covered by trains on this network see the widest range of traffic every day: from hundreds daily to just the lone train per day. Our team of researchers scour through a colossal pile of data every day, in order to discern the facts that will come in most useful for your travel. Occasionally we stumble upon facts that surprise our number crunchers, and which you might find handy and insightful. 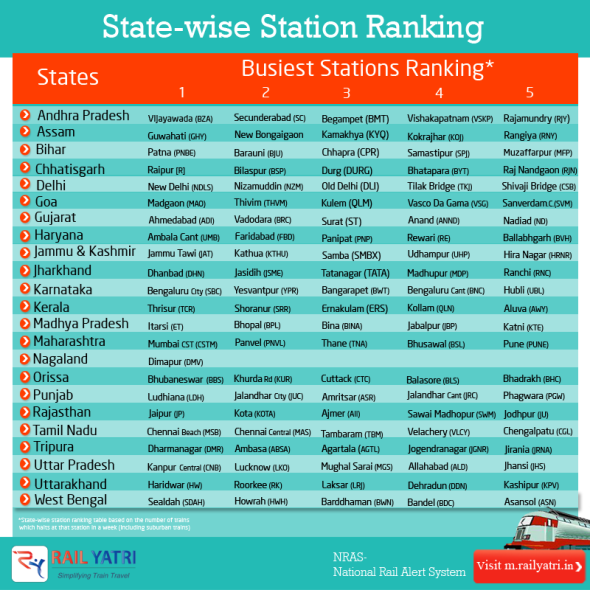 Here’s a state-oriented rank of the 5 most busiest stations. Check it out for your home state- and you may be amused to note that it’s not Allahabad for U.P, but Kanpur; or that Howrah Junction isn’t the busiest Bengal Station, it’s in fact Sealdah! So watch out and prepare next time you have to board a train from any of these stations! If you find this data useful and informative, please feel free to comment and share the experience with us. If you have any queries, or would like to add some information, write to us at feedback@railyatri.in. We will get back to you in a while. Get the smartest train app.